Software testers do the software testing, where they have the final authority to ensure the credibility of software before they reach the market. As a beginner, software testing can be very challenging, when at times you may have to fix erratic issues and bugs. Solving issues all alone can be onerous and you have to lean on the assistance of certain websites that will mentor you on software testing and answer many of your queries related to the job. Apart from reading books on software testing, a clue to certain helpful online tutorials has been listed in this article for you to browse. 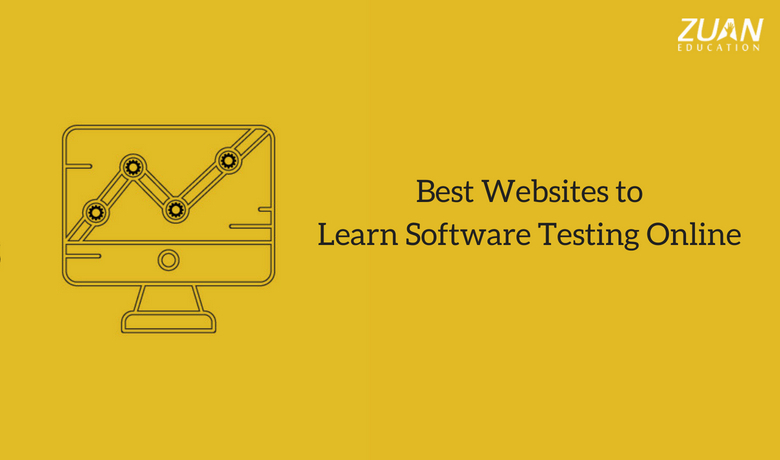 Luckily, there are a lot of websites that will help you learn software testing online. We have suggested 15 top-notch websites, we think will be of use for every software tester to learn software testing online in the year 2018. Let’s take a look at the top resources to learn software testing online that will help you to enhance your software testing skills. uTest is one of the top-rated software testing websites in the world. It has 2,00,000 and more software testers. Courses here are for free. It aids you in elevating your skills based on germane resources that will act as a prop and enhancer of your career in software testing. uTest also guides you with testing projects, participate in event rate tools and chat with users and peers regarding the industry. You can also develop your testing skills through projects available on utest.com. This page consists of practical guidance for a web application tester. Suggestions given on this page will suit all web applications and can be used as a checklist for web app testing. Among the many categories of resources, Udemy has a software testing category where well-planned courses are taught by skilled people in the industry. While at present discount is on the offer for many of the top-ranked software testing online course, some courses are taught free of cost. Lastly, Udemy has a review page for every course where students can give their opinion about the course. Software Testing Help website has numerous topics on Software Testing and Quality Assurance. Having more than one million monthly views, the website addresses to a wide range of testing professionals who seek for updated contents related to testing tutorials, manual testing, automation testing, testing tools, web testing, testing templates, quality assurance, latest testing trends and scores of other information. Having its own pride and record of placing its own software products in the market, Google in its own Google Testers Blog gives invaluable information suggested by its own software testers. It is one of the best resources to learn software testing online. Cem Kaner is a stockpile of resources for software testers. You can also pick up a lot of secrets and instructions from this industry leader in software testing. This is an online community with free membership for software development professionals. The professionals also have access to subscribe to Better Software Magazine published by stickyminds.com that consists of software testing articles. Stickyminds.com features prominent interviews with eminent industry leaders. It also showcases webinars. It also contains conference presentations from TechWell Corp. It serves the needs of both beginner and advanced software testers. Satisfice is the mastermind of James Bach, a reputed person in the software testing industry. Satisfice.com has a wide range of topics related to testing that can be referred both by beginners and advanced testers. James Bach is also available for consultation via Skype. DZone is a hub of technical contents related to software testing and QA. The website acts as a bridge to connect you with industry-oriented professionals. Apart from gaining current insights on the industry, you can also retrieve details on topics such as test automation, DevOps, test management, big data, cloud, AI etc. Marlena has a flair for writing about, writing code, testing, and coding. The author discusses concepts in detail and has also written an interesting piece, on moving from being a tester towards becoming a developer. TechTarget is an online community that facilitates connection with industry-specific professionals who are experts in creating quality software and also perform functions such as software testing, quality assurance, quality software, etc. The website will also ensure that the application developed is of optimal quality, that can be done by employing methods such as DevOps and Agile development. The website also contains numerous white papers and webcasts. Selenium Easy website offers a thorough set of tutorials on test automation using Selenium. Skilled test automation professionals wanting tutorials on Selenium Web Driver, TestNG, JUnit, ANT, Maven, Java (required of Selenium), Jenkins, JMeter, Appium JExcel, Apache POI and JFree Chart can peek into this website. This website has myriad of information on software testing. This website is owned by Elizabeth Hendrickson. Besides, the website would serve its purpose really well if it is updated frequently. This blog elucidates on advanced testing options. Though it has been long overdue since the blog was updated, it still has essential information for software testers. Software QA Test is one of the best resources to learn software testing online. Besides, it is a one-stop source for downloadable materials on Software QA and Testing created by James Bach and Michael Bolton. It serves both as a hornbook and a reference tool for advanced courses. Apart from this, you can also cull out blogs and articles about rapid software testing. Lisa is a trainer in software testing, focussing on agile testing. Being a practitioner too, she imparts teaching and training through her website. This is a website for advanced software testers. The eccentric language used on the website are well thought of to teach software testing. “Refinements on the art of software testing” is the tagline of the blog. Multiple techniques in mastering software testing, such as just imagining a test and speculating its way of working in the field can be learned. QA Intelligence provides information on a wide-ranging of aspects in testing and QA management. It also contains a sample demo from one of the companies. This blog has been constructed by Joe Strazzere and talks about quality assurance, software testing and host of other topics. Essentials of a software tester such as tools, templates, etc. are also provided on the blog. Hence, these are the top 20 resources to learn software testing online. Moreover, the above-mentioned websites and blogs would serve the purpose of learning software testing online. Improve your knowledge by these websites and platforms to ensure that you have the precise information and are capable enough to guarantee that the final product delivered is optimum in quality. As most of the content on the resources are free of cost, you can browse through them for learning as a fresher and also for upskilling. Constant learning and upskilling ensure the delivery of standard products in the market. Great goods from you, man. I have understood that your stuff previous to and you’re just extremely excellent. I really like what you have acquired here, certainly like what you’re saying and the way in which you say it. You make it enjoyable and you still take care of to keep it smart. I can’t wait to read much more from you. All the above-mentioned sites are really good to gain basic knowledge of software testing. Thanks for sharing this. Very Impressive Selenium tutorial. The content seems to be pretty exhaustive and excellent and will definitely help in learning Selenium course. I’m also a learner taken up Selenium training and I think your content has cleared some concepts of mine. While browsing for Selenium tutorials on YouTube i found this fantastic video on Selenium. Great article !! Nowadays more job opportunities are there for software development and software testing. I am searching such kind of article from a long time because it is helpful for every software tester and developer. Keep sharing more on testing. Simply want to say your article is as amazing. The clearness in your post is just nice and I can assume you are an expert on this subject. This kind of information is great and which is used to improve the level of knowledge.